Grace Bennett has just landed the job of a lifetime in her eyes. She will be making more money over the summer months than she dreamed possible. 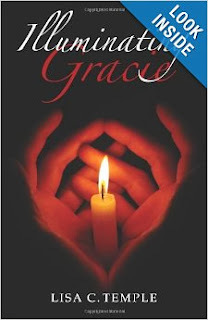 Grace has just a few weeks of high school left and vows she will buckle down and graduate to impress her new employer and to make sure they let her keep her job. After all, they wouldn’t want to hire a high school drop-out, right? She has had a lot of trouble doing her assignments, not because of the difficulty of the subjects, but more because she has been told she has to do it. She has been tested and found to have a genius IQ. Grace’s new employer is Mrs. B. Willem and his grandson, Locke, make Grace feel comfortable and welcome at their home. The handsome Merc, who also lives on the property, seems to be surrounded by a darkness that Grace senses right away, but she also is attracted to him so she doesn’t heed her instinct to steer clear of him. What develops as the story progresses is a battle between good and evil/angels and demons, a battle for Grace’s very soul. There are lots of ups and downs and ins and outs, action and even a little romance, but if I start telling about one thing, it will lead to another and then readers won’t have the enjoyment of discovering this book on their own. There were a couple of things I didn’t like about this book: 1) The use of the Lord’s name in vain, and 2) The theme of having faith in oneself instead of having faith in God. I did like that Grace’s sarcasm is great and funny. It is also used to cover up her insecurities and self-pity. I think most readers can readily identify with using that as a defense mechanism. Her inner dialogues with herself are downright hysterically funny! Grace has some definite problems with authority, an OCD complex, counts to herself to calm her panic and a lot of the usual teenage angst. It made me remember my own teenage years, and thank the good Lord I am an adult now! While this is geared toward a young adult audience, I think many adult readers will be entertained by this supernatural fictional tale. My rating is 4 stars.